Sitting on the start-finish straight with two others for company, the position panel waits for one of the top three drivers to gently ease their car in front of it. 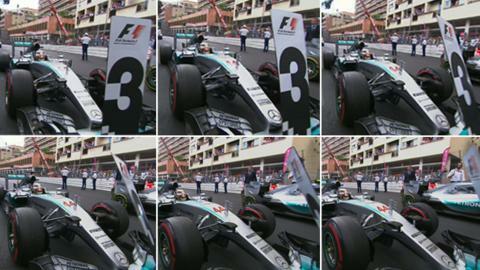 That wasn't the case for the 'number three' board in Monaco. After a needless pit stop saw Lewis Hamilton let slip the lead to finish third, the Briton - still fuming from his team's decision to call him in - appeared to be in a grumpy mood. On the lap of honour after the race, Hamilton stopped his car on the outside of the Portier corner, with the front of his Mercedes overlooking the sea. As Hamilton sat in his cockpit for a good minute or so, staring out to the Mediterranean Sea, the thoughts of those watching turned to the moment Ayrton Senna abandoned his wrecked McLaren at the same corner during the 1988 grand prix and promptly walked back to his Monaco flat without saying a word to anyone. Hamilton, did not follow in the footsteps of his hero this time. Instead he fired up his Mercedes, swung it round the remainder of the slow-down lap and promptly slammed the front of his car into the awaiting position panel. For that brief moment, Hamilton the slick and professional world champion disappeared. Hamilton was like a child who had just lost a running race they were convinced they would win. Much like smashing a racquet in tennis or kicking a goalpost in football, it was a hilariously petulant reaction. And we loved it.